Tennessee is losing their entire starting defensive line after this season. Kyle Phillips, Shy Tuttle, and Alexis Johnson are all seniors, and key backup Paul Bain is also a senior. The Vols need immediate help along the defensive line, and that’s why they’ve pursued several junior college linemen in the 2019 cycle. And they just sent out an offer to another JUCO defensive lineman in this cycle. 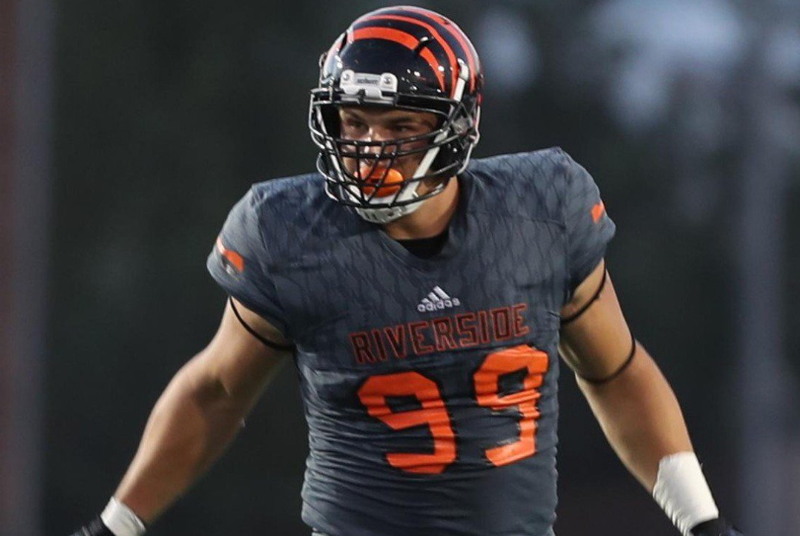 Nick Figueroa is a 6-foot-5, 270-pound defensive end who plays for Riverside Community College in California. On Monday, he tweeted out that Tennessee had extended an offer to him. According to 247Sports, Figueroa is a low three-star JUCO defensive end who is rated as the No. 159 overall JUCO prospect and the No. 13 strong-side defensive end in the JUCO ranks. The Vols aren’t the first Power Five team to offer him, however. UCLA, Virginia Tech, California, North Carolina, Arizona, and Oregon State have all offered him, as have UCF and Houston. Originally, Figueroa signed on to play with Cal Poly at the FCS level, but after taking a redshirt year in 2017, he decided to take the JUCO route for the 2018 season. He now plays for Riverside and has been a standout on the defensive line for them. He played both football and baseball for Cajon High School. In high school, Figueroa didn’t start playing football till his senior season. He focused primarily on baseball till his final year of high school, and he was very successful as an outfielder and designated hitter. He had a .323 batting average as a junior and upped that to .337 as a senior and added three home runs, eight doubles, 24 RBI, and six stolen bases. Once he started to play football, however, Figueroa found he excelled there as well. In his one season of football in high school, Figueroa totaled 86 tackles, 12 sacks, 19 tackles for loss, a forced fumble, a fumble recovery, and three pass break-ups according to his bio on Cal Poly’s website. After redshirting in 2017, he joined Riverside for this season and has thus far shown a knack for being extremely disruptive on defense. Though he doesn’t have the bend a lot of scouts and coaches look for in a defensive end, Figueroa is very strong and has a variety of moves that helps him shed blocks. He has a very good bull rush and also possesses an effective spin move to get by blockers. Not only is Figueroa a pain for opposing quarterbacks, but he’s good at stopping the run too. He plays both inside and outside on the line, and that versatility helps him create tons of defensive opportunities. He’s incredibly strong and has a great frame. You can tell he’s still a bit raw and has more to learn, but there’s a lot to work with in terms of his motor and his skill set. In eight games for Riverside, Figueroa is averaging a sack and two tackles for loss per game. He already has 29 tackles, eight sacks, and 16 tackles for loss in the eight games he’s played in this season according to the school’s site. He’s only gone one game this season without recording a sack, and he’s tallied at least three tackles for loss on four separate occasions this season. The Vols already have a pair of JUCO defensive linemen committed to them in their 2019 class. Savion Williams, the No. 1 JUCO defensive tackle according to 247Sports, and three-star JUCO defensive tackle Darel Middleton are both committed to Tennessee in this cycle.